Primaries next Tuesday could be decisive, with a broad array of competitive contests being set from New Jersey to California — where a primary system that advances the top two finishers, regardless of party, could mean that two Republicans are facing off in seats Democrats hope to target. Republicans have seen some small signs of optimism lately, after months of a dour outlook. President Trump's approval ratings have ticked up; Democrats' once double digit advantage on the question of who people prefer to control Congress has tightened; the economy is improving; unemployment is low; and the GOP believes Americans are finally starting to feel the benefits of their tax cuts. Still, even with those new glimmers of hope, most Republican strategists say their chances of keeping the House are 50-50, at best. That's because of history and other fundamentals. On the issues at play, Republicans believe their tax cut messaging is starting to break through, but Democrats believe that in this midterm campaign they can use health care, ironically, to their advantage. "The shoe's on the other foot," said a Democratic House operative of healthcare as an issue that might work for their party, with memories of 2010 when it was the issue that cost them the House majority. This operative noted that premiums are expected to spike in October, betting the GOP will get the blame this time around. "Republicans have a healthcare political nightmare that they have no idea how to message on. They don't even want to touch it. They don't want to talk about it. Health care is popping as the No. 1 issue in polling." 1. Can Democrats capitalize on Republican retirements? Enthusiasm is on Democrats' side. They have over-performed in special elections, seen heavy turnout in primaries, recruited strong candidates, and raised a good amount of money. Plus, women are winning many of the Democratic primaries, something the party hopes will drive voters to the polls in an effort to send a message to President Trump. All of that energy has come with a record number of Republicans retiring from the House or seeking other office. Most of those are in safe GOP territory, but about a dozen members are leaving behind seats that have now become competitive races. In fact, Republicans privately concede that about half of those might well be out of Republicans' reach already. That's because many of these districts are either areas that Hillary Clinton won, or the 2016 result was so close that these Republicans decided it was better to walk away, rather than wage the kind of fight necessary to retain their seats. Places to watch, for example: in Miami, Clinton won Republican Ileana Ros-Lehtinen's district by nearly 20 points; in New Jersey, longtime Rep. Rodney Frelinghuysen's North Jersey district went for Trump by just a point, and in South Jersey, Trump won Frank LoBiondo's district by less than 5. Court-ordered redistricting in Pennsylvania will also likely cut into the GOP majority. Two Pennsylvania seats – the 6th and 7th congressional districts — are already now favored to move into Democrats' column. In both places, the districts were redrawn to include territory that Clinton would have won, and the Republican representatives in them have resigned or will retire. 2. Can the Republican incumbents, who decided to stay, hang on? 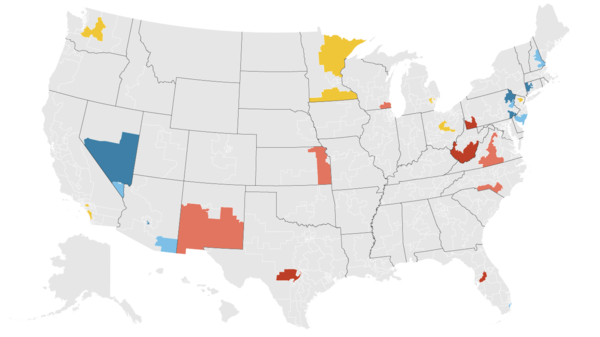 Several key districts that look, on paper, like they should be ripe Democratic targets have entrenched incumbents in them, who have persisted despite strong headwinds in past years. Republican lawmakers like Will Hurd in South Texas, Mike Coffman in suburban Denver, as well as Californians David Valadao and Jeff Denham have been perennial Democratic targets, but also survivors. They appear ready for the fight again, as strategists on both sides of the aisle credit these members with building brands independent of the president — and sometimes speaking out against him. Many of these legislators, for example, pushed GOP leadership to hold a vote on immigration legislation. Whether these Republicans survive again will depend on the size of a Democratic wave. No matter how well they run their campaigns, they likely wouldn't make it through a political tsunami. Democrats say their polling shows challengers running well against some of these incumbents. And several good politicians with centrist, independent profiles lost in 2006 and 2010 — the last time there were massive waves for both parties in the House. 3. Will anti-Trump feeling in the suburbs swamp the GOP? The type of seats that GOP operatives are most worried about are in the suburbs, and they're largely vulnerable because of Trump. These areas were once solid Republican strongholds, but they saw massive swings in the 2016 elections. Many suburban congressional districts, for example, voted for Mitt Romney by large margins in 2012, but went for Clinton four years later. These are affluent areas are full of highly educated voters, frustrated with Trump's approach to politics. Even if these voters may like their own member of Congress, Republican operatives fear they could take it out on the party in the 2018 midterms as a way to register their dissatisfaction with the president. "Trump has opened the door for them to be able to vote for a Democrat, but the Democrat has to prove they're worth the voter walking through the door," said one Democratic operative involved in House races. "We have to convert Trump skeptics into Democratic House voters this cycle." Orange County, Calif., is one place where this theory will be tested — but there's a twist. Democrats first have to get their candidates through California's top-two primary and avoid getting locked out of very winnable races. It's possible that, because there are so many Democrats running, that they split the vote and two Republicans advance to the general election in a couple key races. Democrats are bracing for the possibility that no Democrat advances in the race to replace Republican Rep. Dana Rohrabacher, a Trump loyalist, who is sitting in a district that Clinton carried. The same could happen in Southern California seats held by retiring Reps. Ed Royce and Darrell Issa. National Democratic groups are spending big to try to avoid that nightmare scenario. Two or three seats off the table in California, plus one that fell further down the list in Nebraska already, could mean the difference between the majority and the minority. Republicans, though, are souring on their chances in suburban Washington, D.C., where Virginia Rep. Barbara Comstock remains one of the most vulnerable incumbents. Clinton won her Northern Virginia district by 10 points. Democrats are also looking slightly further down I-95 in the Richmond suburbs at the district held by Rep. Dave Brat. Brat shocked the political world in 2014 when he knocked off then-Majority Leader Eric Cantor in the GOP primary. Since then, the area's demographics have been rapidly changing. Trump won the district by less than 6 points. In Texas, watch suburban Houston and Dallas. Clinton carried GOP Rep. John Culberson's district outside Houston, as well as Pete Sessions' Dallas-area seat. 4. Can the GOP mitigate losses by going on offense to win "Trump Democrats"? Neither party thinks that kind of wave, with no losses for the Democrats, will happen this time. There are 13 districts Trump won that have Democratic incumbents in them. These are blue collar, rural places, where the president remains popular. The most important state to watch is Minnesota. The open seats of Democrats Tim Walz, who's running for governor, and the retiring Rick Nolan are prime GOP targets. Trump carried their districts by double digits in 2016.